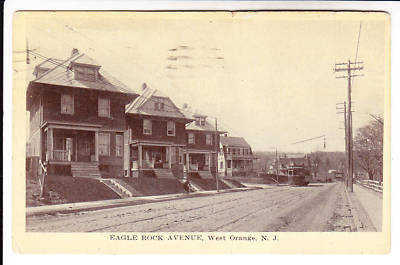 Before West Orange (founded in 1863) was even a town, the part of Orange Mountain known as Eagle Rock was already a bit of a tourist attraction, thanks to its incredible panoramic views of New York City, Newark and the harbor. Llewellyn Haskell (whose lasting fame would come from creating the country’s first private gated community, Llewellyn Park, just down the hill off of West Orange’s Main Street) was smart enough to buy up land that included Eagle Rock and much of the east-facing slope of the mountain in 1854, building an iconic house for himself on top called The Eyrie. By the 1870s, Eagle Rock Resort had sprung up on the mountain, with a hotel, cottages and a café. The trick for these new businesses was bringing a steady flow of customers up to the top of the mountain, which was no small feat given the difficulty of getting up the steep slope. 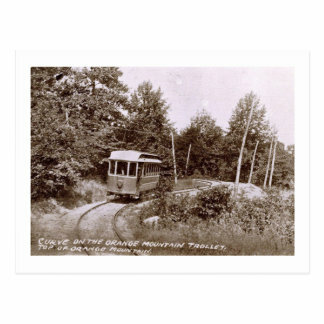 A special trolley line was opened in 1894 to bring visitors from Main Street most of the way to the top. At the end of the line on Mountain Avenue, just below Eagle Rock, the City View Hotel was built (it stood at what today is the corner of Mountain and Murray Street). In addition to the hotel, City View boasted a restaurant, ice cream shop and free vaudeville entertainment at night to attract visitors. But just a month after it opened, on August 26, 1894, the Eagle Rock trolley had its first serious accident. Crowded with passengers on its way down the mountain, the trolley’s brakes failed near the corner of today’s Nutwold Avenue and Amos Street. When it got to the next curve, at today’s Moore Terrace, the careening car derailed and flipped on its side. Amazingly, no one was killed, although 15 passengers were badly injured, including a boy who was pinned under the car and had to have his mangled arm amputated at the elbow. The operator, Suburban Traction Company, declared bankruptcy before any of the victims could collect on their lawsuits. There was another accident on June 5, 1903, when the passenger-filled trolley somehow began to move back down the hill at 9:40 pm while the motorman was still inside the hotel. It wasn’t until the car started rapidly picking up speed on the steep slope that the conductor noticed there was no one at the brakes. Like the previous accident, the trolley jumped the tracks on the curve at the bottom of Nutwold Avenue, and most of the passengers jumped off before the car was smashed to pieces. Again, amazingly, there were no fatalities. Essex County had started purchasing land on the mountain in 1895 to create Eagle Rock Reservation — together with South Mountain at the other end of West Orange, they would become the first county parks in the country, laid out by iconic landscape architect Frederick Law Olmstead and his firm. In 1907, the parks commission replaced the crumbling old rock wall at the overlook with a sturdy cement wall that still stands today. Although it has been updated with various structures and statues to commemorate the September 11th attacks (many people gathered at this impressive viewpoint to watch that day), the iron spikes that discourage people from climbing over the top of wall are original. Just to the north of the memorial, the building known today as Highlawn Pavilion was originally built as a casino (not a gambling casino, but an open-air structure) in 1912. Thomas Edison would conduct top-secret experiments here for the U.S. military in 1917. After years of such disuse and disrepair that it was slated to be demolished, the building was renovated in 1986 to become one of the highest rated restaurants in New Jersey. The steps themselves became almost as much of a tourist attraction as the view or the amusement park and resorts — a rite of passage people loved to send postcards of to brag about what they’d accomplished. From the overlook at Eagle Rock, visitors could then walk across the mountaintop to the Crystal Lake resort and amusement park — for more on that, see my first cache The Heyday of Crystal Lake. The hotel changed names under new owners to Cox’s Hotel and later the Underwood Brothers Café and Restaurant, but with the advent of the automobile and the freedom it offered, the destination couldn’t pull in customers like it used to. (For more on the first American auto races, where some of the first cars tried just to make it up this hill, see my cache on The Great American Hill Climb.) The trolley shut down on April 19, 1924, the hotel followed suit, and eventually the steps rotted and were forgotten, only visible from a couple of vantage points like this cache. Speaking of the cache, you're looking for a plastic ammo can large enough to hold assorted knick-knacks, including a rose compass geotoken for the FTF as well as some historic Thomas Edison postcards. (There's also an FTF geocoin, but as I found that in someone else's cache and it has a tracking number, I'd appreciate you logging it and moving it on!) While it is definitely possible to bushwhack your way up the old 100 Steps from the bottom (I foolishly did that with my kids to hide this one), it's a heckuva lot easier to start from the top: At the memorial/overlook area, head to the far right where the wall ends — you'll notice a faint path going down that will take you to the cache in a mere 50 yards.